Last week, we realized that we have been enjoying lots of red meat dishes and it is affecting our health a tad bit. So we wowed to weave more fish, vegetables, grains and legumes into our daily diet. I know it will be better for my health but I have hard time giving up the red meat even for a couple of days. It is not in my genes, my family does not give up on that kind of stuff. Growing up, I had many lunches and dinners with my grandparents. My grandfather, Ziya, was really particular when it came to his food. Well, he was a very opinionated person…And food was no exception. For him to call it “dinner “, there were certain things that had to be present at that table: Soup, green salad, meat dish, pilav or pasta to serve the meat dish with and a vegetable side dish, zeytinyagli followed by dessert and seasonal fruit , capped with Turkish tea. It always ended with my mom leaving the room, talking to herself in frustration. So, yes, we love our food and we always have hard time with giving it up. My mom has been the only one, always disciplined, always on some sort of diet but somehow here or there she realizes her weaknesses. I gave up once, became anorexic and after that I promised myself not to do such crazy, non-sense unhealthy things. But I guess the moderation is the key! I do not need to panic, we are not turning vegetarians here and no need to whine about it as my freezer has respectable amount of meat that can be thawed in emergencies. But I needed some kinda “end-of-the-season” bang before I get used to the idea of having only one vegetable dish and salad on the table for most days of the week. I have always been very fond of kababs, mostly lamb ones. 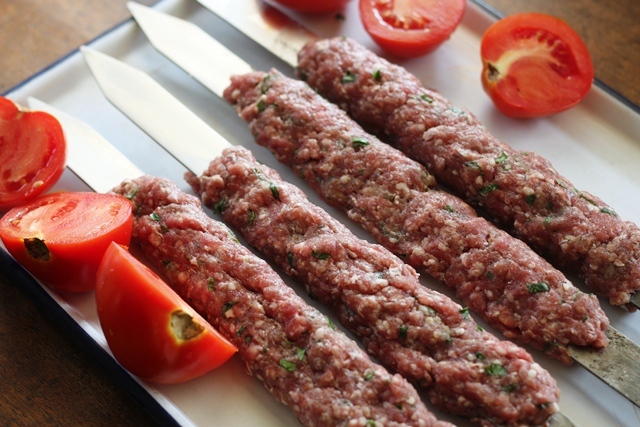 I make them either with small-cut meat on skewers or ground meat patted around wide, flat metal skewers. If you like kababs, and would like to challenge yourself in wrapping your meat around one of these, go ahead and get yourself a set of one inch or wider skewers. In Turkey though, we do not make it at home. We go to the restaurants that specializes in kebabs. Especially, ocakbasi restaurants. 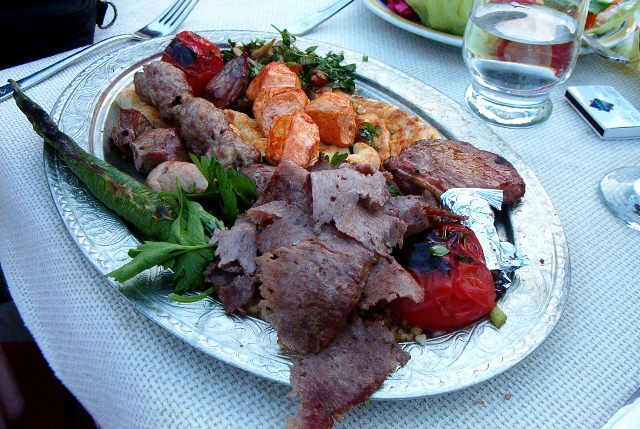 At these restaurants, you can sit around a big charcoal grill and drink your raki and eat your meze while they cook your kabab in front of you. I always left those restaurants happy, full, a little tipsy and probably smelling like a chimney sweeper. But the taste is very much worth that last outcome. If you want to create the same atmosphere at home, chill your raki and get to work. You either have to really finely chop the onion (possibly in food processor) and give it a good squeeze to get rid of the water. I grated mine, put it in the cheese cloth and squeezed all the juice out of it. I do not like my meat sit on the skewers for a long time as onion might release more water, causing it fall from the skewer. I usually mix the meat with the dry spices and let it sit for an hour or so in the fridge before I add onion and finely chopped parsley. 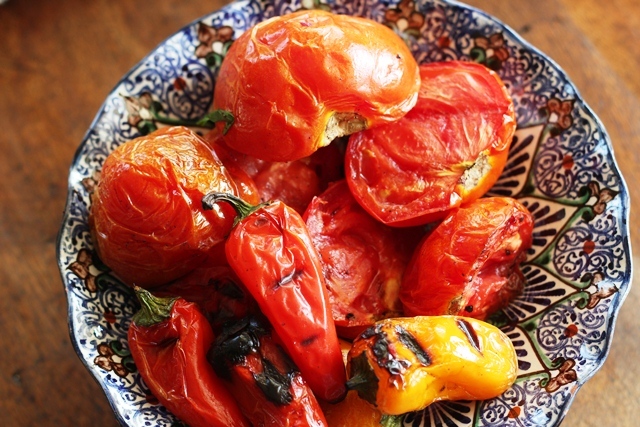 After I mix in those last two ingredients, I immediately wrap it around the skewers and head to the grill.While I am at it, I throw some tomatoes and peppers on the grill as well. You know, so I can have a balanced meal! Now, that is The Kebab I needed to start my “less red meat” action. 1. Mix dry spices with the meat. Let it sit in the fridge for an hour. 2. Add onion, garlic and parsley. Divide the meat into four equal pieces. 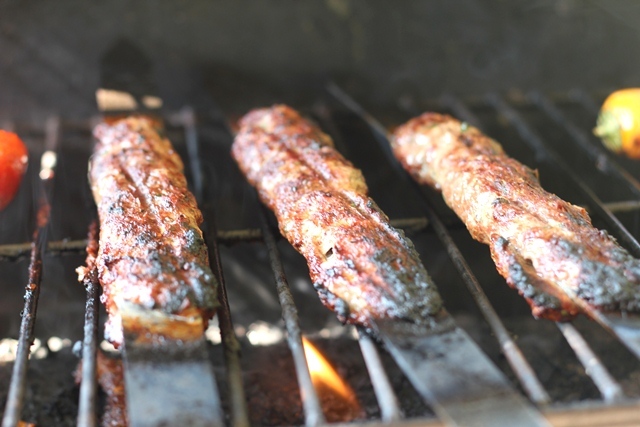 Wrap it around the 1-inch wide skewers, patting them down to about 8 inch long kebabs. 3. 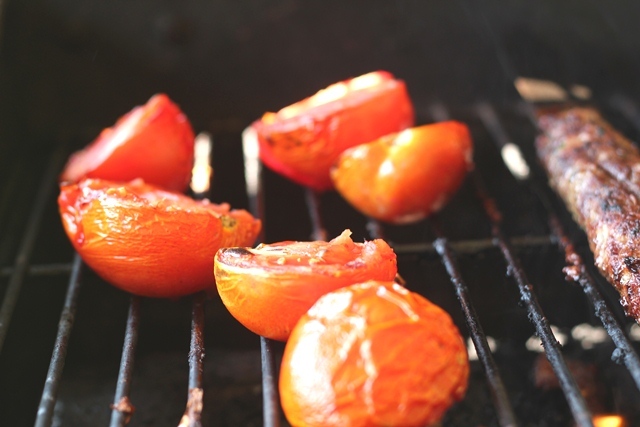 Cook it on the grill about 3-4 min on each side (depends on how hot your grill is). 4. 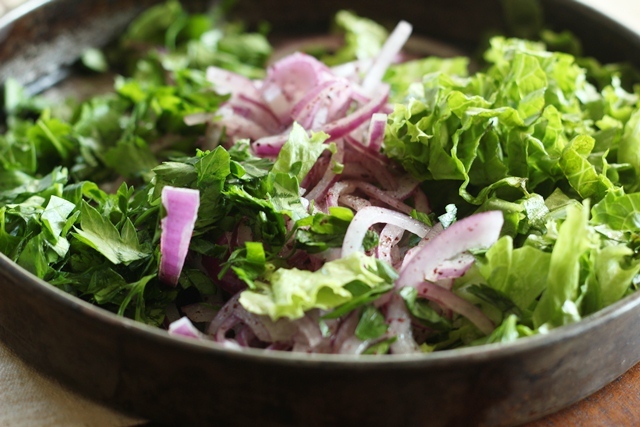 Serve with lavash bread, red onion, sumac, more parsley and grilled vegetables. Referring back to one of your previous posts, I’m lucky with regards to monitoring my meat consumption due to the fact that I dislike making meat at home. For that, I happily live primarily on a vegetarian diet and eat meat maybe once a week at most. I have quite the opposite experience – I suddenly become very aware of how my body needs MORE meat for my health. The sudden craving for meat is phenomenal. Lamb is one of my favourites and looking at these make my heart race with want. I’ll need to find a good place in the are that can make a dish as beautiful as this! That looks so absolutely delicious. I sure would love to travel with you in Turkey so you can explain all of the nuances, ingredients, and stories behind all of the food. Those kebabs look delicious on those wide skewers. I’ve never seen that before! Good luck with moderating your meat intake…dishes will taste all the most special perhaps! Don’t get me craving, Ilke!!! I will make sure I get brought to the specialized kebab shop the next time. When we went to Çiya Kebap last time, they did not cook the kebap in front of me. PS: I love all the crockery you have in this post!!! Love this! Kebabs are great. It kinda stinks that for health reasons many of us need to eat less red meat, but you can do some fabulous stuff with veggies. Good post – thanks. wow I need this too! You know, my husband is a huge fan of Turkish food…this is definitely a treat for him. p.s If you don’t have Ovaltine malt chocolate powder on hand, stand hot chocolate drink powder or just cocoa powder would be just great too. Thanks Angie. I did not know what it was. Makes it easier now. I have never seen those wide skewers. I want some! The lamb looks so delicious wrapped around them. Hey man, if i don’t leave the restaurant smelling like a chimney then I CLEARLY haven’t gotten my money’s worth. This is a brilliant post to see that the start of the day. 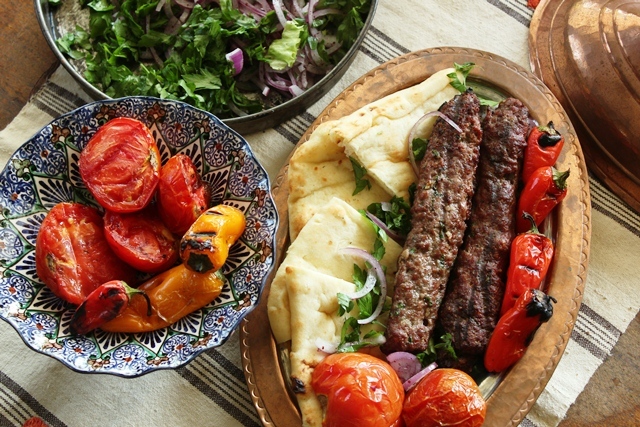 Great colors, gorgeous dishes, delicious food…loving me some kebabs. Mmmm, kebab. 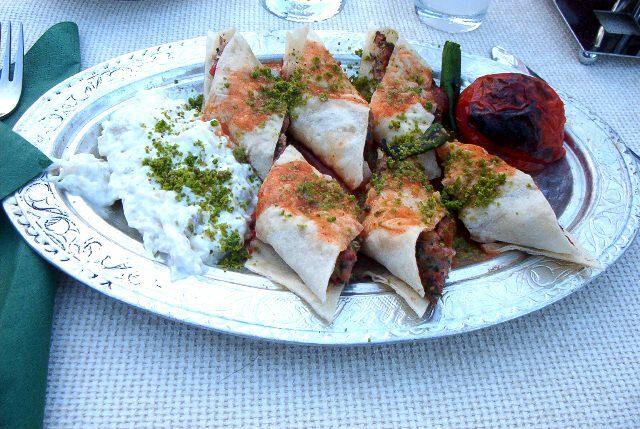 That second picture from Turkey looks awesome– the wrap with pistachios? Yum! We are vegetarian about 80% of the time, and it really does help keep the health/weight in check. But once in a while, we splurge. What better way than with a spiced lamb kebab! I usually ask the butcher to ground the lamb twice, it makes the kebabs more tender. A tip I picked up from a Persian friend. You must come to LA so we can cook together sometime! 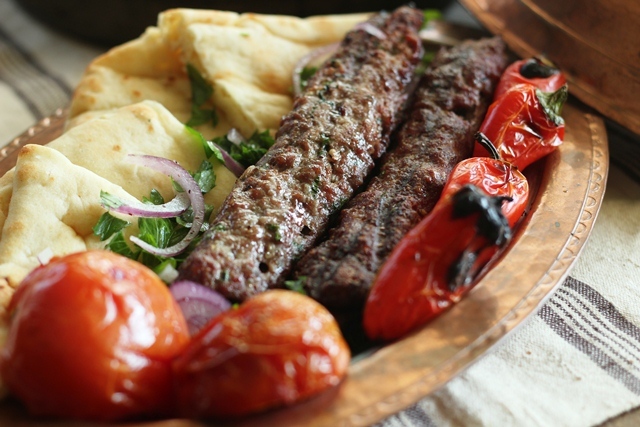 Oh my – love lamb kebabs so much! I make them all the time and this sounds like an awesome recipe. Going to save it. Greetings from Malaysia. I saw your blog through tastespotting! I’ve always been obsessed with Turkiye, its food and culture! Would love to visit one day. ooooh, Ilke…we are back from your fabulous country! So many sights, sounds, and smells are still whirling in my head. I can’t thank you enough for all of the recommendations. Look…here I am on your blog getting the recipe to make kebabs tomorrow! I’ve made it twice now in the past month, I do add some hot red pepper paste to the mix and maybe a little more alepo pepper but we like things spicy. This time I did 12 different dishes for a Turkish dinner for 25. Everyone loved the lamb! I bought a boneless leg of lamb and minced my own by breaking it down into cubes (and trimming fat and membranes), freezing them then mincing them in the food processor. The lamb was delicate, tender and most beautiful. I trimmed it so much that I actually got a little too lean and had to add extra olive oil. I make small patties and cook them up as I am making the mixture to be sure I am happy with the spices before I cook up a large batch.